This bridge bidding cheat sheet is available for members to download from No Fear Bridge. The bridge bidding chart covers two sides of A4 paper and is designed so that it folds into three. Print it onto a sheet of card, fold it up and it will fit neatly in your pocket or purse. The bridge cheat sheet has opening and responding bids along with rebids and overcalls. There is a summary of bridge scoring along with points counting and points needed to achieve part games, game, small slams and grand slams. Not only does the sheet make a handy reference guide, it is also a great aid to learning. 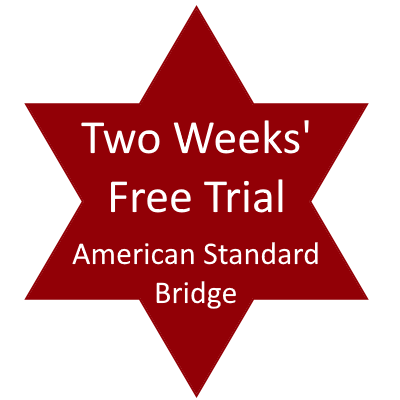 Memorise one small part of the cheat sheet each week and you will soon be on your way to remembering and using all of the common bridge bids. You can download the crib sheet if you join No Fear Bridge for a trial membership (this is a no obligation trial, with no financial details taken unless you decide to take full membership). For the Acol bridge crib sheet – join HERE. For the American Standard crib sheet – join HERE. a shout out from Porter Tx! Just wanted to say keep up the great work!